Magic Ticks You Can Do! Now you can learn some amazing and easy magic tricks to entertain your friends. A great magician keeps the secret. So don't tell anyone how the trick is done. The videos below will teach you the performance and the secret of each of the magic tricks from the Magic Tricks You Can Do booklet. Always practice the trick to make sure you can do it well before showing it to your friends. Magic is all about entertainment and fun! 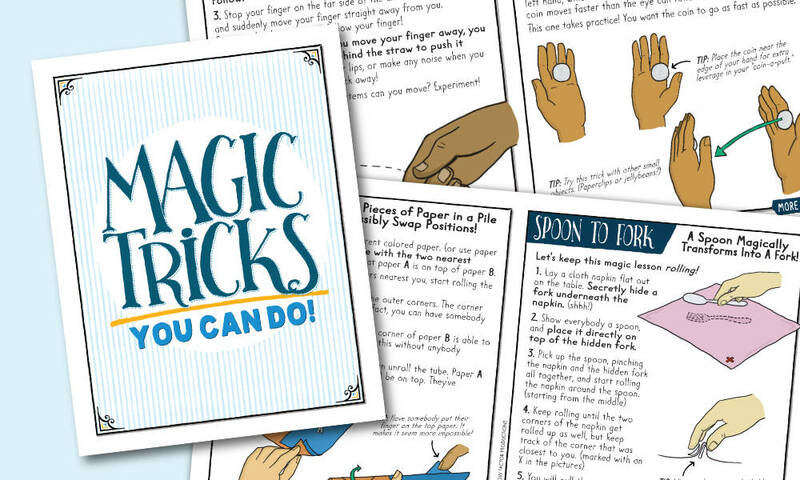 Click on the videos to learn each of the fun magic tricks! Magician shows a card printed with five cards, both front and back. 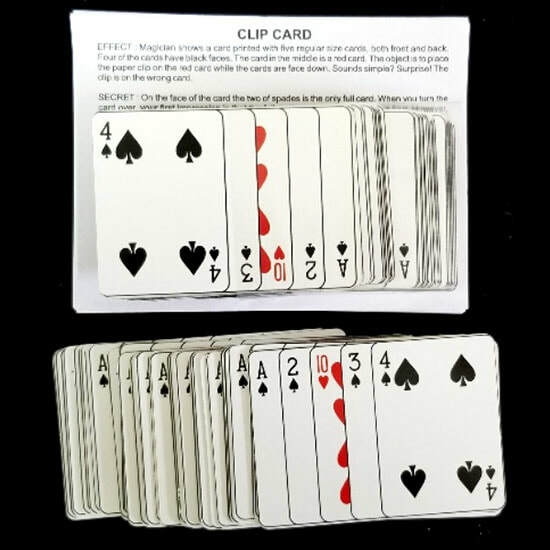 Four of the cards have black faces. The card in the middle is a red card. 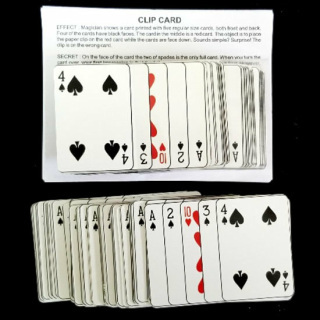 The object is to place the paper clip on the red card while the cards are face down. Sounds simple? Surprise! The clip will always be placed on the wrong card. A very effective and easy close up item, based on an old ring & rope trick. The new all metal version makes it a very easy to carry and perform impromptu effect. You can even wear the chain with ring as a “necklace” to perform street magic. The performer displays a solid metal chain, and a 1.5" diameter metal ring. Both can be examined by the audience. The ring is passed over the chain from the bottom, with the chain draped over the performer's thumb and finger. He just drops the ring as it reaches the top, and in a flash the ring is found knotted on the chain. The spectator can examine it, and remove the ring off the chain himself. Once you use it, you will always carry it with you – ready to use any place, any time. A neat looking little vase is placed on the table. You remove the cover. 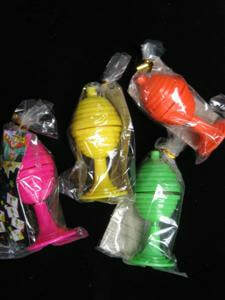 Sitting in the case is a colorful ball, which you remove and place into your pocket. You cover the vase and then snap of your fingers. You remove the cover again, the ball is back in the vase! Even a four year old can do it! Once you place a coin into the magic slide, it vanishes and reappears at the Magician's will. Also, one coin can magically transform into another and back again! Seems to be impossible, but watch your friends puzzle over this one! 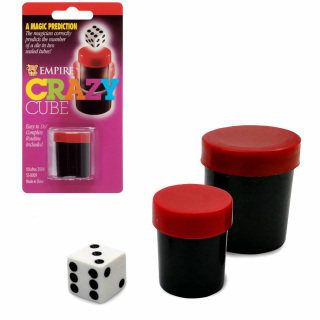 You hand a spectator a regulation die, two small containers and two covers. Ask the spectator to secretly place the die into the smaller container with ANY number facing up, and cover the container. To be safe, you place that container into another. You can always announce the selected number.